He came to the tea garden fellowship with a friend and he left with a new Friend, Jesus! That night he prayed; not for health, more money, better job, the things you would think one living in poverty would ask for. This man prayed for Jesus to provide him with a Bible and someone to teach him how to read it, he was illiterate. Within 24 hours God answered his prayer, he was given a Bible, but He didn’t provide someone to teach him how to read. Instead God Himself taught him how to read. As the man opened the Bible and looked down at the first page he began to read it aloud, much to his surprise and those watching! The man soon moved into that village, even though he didn’t work in the tea garden. He began to read the Bible to himself, his family and soon his neighbors came and asked him to read to them as well! Why did the villagers ask him to read to them? Because they watched this man’s life change before their eyes! He now is an elder in that church and each Sunday reads the Scriptures in the service with the most gorgeous reading voice you have ever heard! According to American Bible Society and Barna Group’s 2015 State of the Bible report: 98 percent of those surveyed believe every person in the world should have the freedom to own and read a Bible. Interestingly enough, when you begin a conversation about the availability of the Scriptures globally, many Americans are stunned to hear that in reality more than half of the world’s population doesn’t have access to the Scriptures! How many Bibles do you have in your home? Many of us in the US own a number of Bibles and find it hard to imagine someone not owning their own. Yet, most of those living in rural villages in South Asia do not have a Bible in their home and often not in the whole village. They rely on the pastor to tell them what it says. Reading the message of God’s Word, in your heart language, transforms lives! There is nothing as rewarding as presenting someone with a Bible of their very own in their heart language! As believers we are told to preach the gospel to the world. 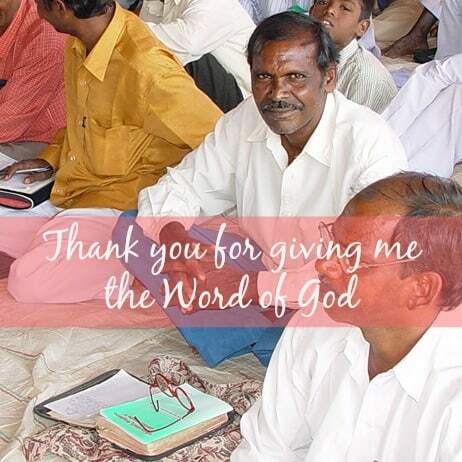 Besides personally sharing the gospel with those you come in contact with, you can actively be a part of fulfilling the command by providing Bibles for those who don’t have access to one in South Asia. Are you looking for an opportunity for your children to invest some of their money in the lives of others or to teach them to give? Providing a Bible for someone who doesn’t have one is a perfect way to do so. They are within their budget and will change the life of the one receiving it. Is there someone in your life who is hard to buy for or has everything? Or perhaps you would like to honor someone you know, or give a gift in memory of someone who has passed away. You can do so by giving a Bible in their name. Just let us know and we will send your honoree or family members a personalized card acknowledging the gift you have given in their name. For an investment of only $6 you can bring the Word of life to someone, and in some cases to a whole village!